환벽당은 사촌 김윤제(沙村金允悌, 1501～1572)가 노년에 자연을 벗 삼아 후학양성을 목적으로 건립한 남도지방의 전형적인 유실형(有室形)정자로 가까이에는 무등산 원효계곡의 계류가 흐르며 계곡아래 증암천(甑巖川) 주변에는 배롱나무가 아름다운 장관을 이뤄 자미탄(紫薇灘)이라 불렀으며, 특히 이곳은 무등산을 비롯한 원효계곡의 줄기를 따라 자연 풍광이 수려한 지역으로 예로부터 시인묵객들이 자주 드나드는 명승지였다. 환벽당 북쪽으로 200미터 떨어진 곳에는 사촌 김윤제가 살았던 충효마을과 증암천 너머에는 송강 정철이 살았던 지실마을이 있으며 환벽당 아래에는 송강과 사촌이 처음 만난 곳이라는 전설이 깃든 조대(釣臺)와 용소(龍沼), 쌍송(雙松)이 있어 역사적 가치가 뛰어난 곳이다. 면앙정 송순은 서하당 김성원이 식영정을 건립하고 3년이 지난 뒤 1563년 식영정의 시를 차운하며 ‘식영정과 환벽당’은 형제의 정자라고 하면서, 소쇄원과 식영정, 환벽당을 가리켜 한 동(증암천)안에 세 명승 즉, 一洞之三勝이라 말한다. 환벽당은 환벽(環璧)이란 뜻 그대로 푸르름이 고리를 두르듯 아름다운 자연경관을 이루고, 시가문학과 관련된 국문학사적인 인문학적 가치가 매우 큰 곳이며, 별서원림으로서 가치가 우수한 호남의 대표적인 누정문화를 보여주는 곳이다. 환벽당이 위치한 곳은 무등산 북능의 능선으로 북봉을 거쳐 꼬막재로 이어지는 여러가지 지맥 중의 하나이며, 사촌 김윤제(1501-1572)가 태어난 충효마을 남쪽 200m지점에 있다. 또한 광주와 담양을 경계로 흐르는 증암천(별칭 : 자미탄)을 사이에 두고 남쪽 무등산에서 북쪽 성산에 이르기까지 산들이 고르게 파노라마 경관을 보여주는 선경을 이루고 있다. 환벽당 주변에는 사촌 김윤제가 살았던 충효마을과 송강 정철이 살았던 지실마을, 소쇄공 양산보가 살았던 창암촌이 있으며, 이 마을들 주변으로 식영정(息影亭)과 면앙정(俛x仰亭), 송강정(松江亭), 은거를 위한 독수정(獨守亭)과 소쇄원(瀟灑園), 환벽당(環碧堂) 등 10여개 정자가 소재해 있어 이 일대가 조선시대 원림 문화의 중심지역으로서 가치가 뛰어나다. 환벽당은 당대 최고의 석학들인 송순, 임억령, 양산보, 김인후, 김성원, 기대승, 고경명 등이 드나들던 곳으로 수려한 자연경관을 감상하고 시문과 가사를 지으며 풍류 문화의 극치를 이룬 조선시대 사림문화의 중심으로서 역사 문화적 가치가 뛰어나다. 환벽당의 초기모습은 소세양(1486～1562)이 지은 “환벽당“시를 통해서 알 수 있으며, 삼연 김창흡(三淵金昌翕 1653～1722)의 『南遊日記』를 통해 그 당시의 원림의 식물상과 조경수종을 짐작할 수 있고, 김성원((1525～1597)의 “서하당유고“ 에 ”성산계류탁열도”등의 그림이 남아있어 인문적 가치가 있다. 환벽당 관련 시·문은 당대의 일류 문인들로서 임억령, 기대승, 송순, 김인후, 소세양, 정철, 백광훈, 고경명, 권필도, 정홍명, 목장흠, 이은상, 이하곤, 이명한, 김창흡, 조상건, 양경지, 정민하, 서봉령 등 시인묵객의 시가가 전해져 인문학적 가치가 있다. Built by Kim Yun-je (pen-name: Sachon, 1501-1572), a Neo-Confucian scholar of the early Joseon Period, with the aim of spending his final years in a peaceful natural environment educating local youths, Hwanbyeokdang Pavilion houses a study room on one side of the building, displaying a unique architectural element established through the pavilions built in the southwestern part of Korea. The pavilion is located near Wonhyogyegok Valley of Mudeungsan Mountain; down in the valley is a beautiful crape myrtle grove called Jamitan (Crape Myrtle Rapids) on one side of Jeungamcheon River. The area around the pavilion, including Wonhyogyegok Valley, creates fascinating landscapes whose beauty has been widely praised among the men of letters visiting it. About 200 meters north of Hwanbyeokdang is a village called Chunghyo Village where Kim Yun-je spent his last years; beyond Jeungamcheon Stream is Jisil Village, which once housed the home of Jeong Cheol (pen-name: Songgang, 1536-1593), an eminent Neo-Confucian scholar-statesman of the mid-Joseon Period. Other attractions contributing to the historical significance of the pavilion include a fishing place where the two historic figures, Sachon and Songgang, first met, a waterfall with a pool under it, and a pair of pine trees. According to Song Sun (pen-name: Myeonangjeong, 1493-1583), who wrote in 1563 -- three years after the completion of Sigyeongjeong Pavilion by Kim Seong-won (pen-name: Seohadang, 1525-1597) -- a poem with rhymes taken from a poem hung in the pavilion, Hwanbyeokdang and Sigyeongjeong were like brothers. Together with Soswaewon Garden, the two formed “the three great attractions in one valley (i.e., Jeungamcheon Stream).” As the name Hwanbyeok (literally “loop of the blue”) suggests, the pavilion is surrounded by breathtakingly beautiful scenes of nature and connected with a wealth of literary heritage created during the Joseon Period. It is also a fine example of the local tradition of the Honam region wherein pavilions are located in the midst of nature rather than in a residential area. Specifically, Hwanbyeokdang Pavilion is located 200 meters south from Chunghyo Village where Kim Yun-je was born, on a ridge running northward from the summit of Mudeungsan Mountain and linking Bukbong Peak and Kkomakjae Pass. 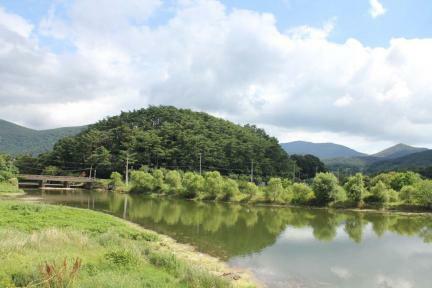 Mountains including Mudeungsan in the south and Seongsan in the north -- with Jeungamcheon River flowing between Gwangju and Damyang – constitute the fascinating natural spectacle around the site. Around Hwanbyeokdang Pavilion are historic villages connected with renowned men of letters such as Chunghyo, Jisil, and Changam Villages, which once housed the homes of Kim Yun-je, Jeong Cheol, and Yang San-bo (pen-name: Soswaegong, 1503-1557), respectively, and historic pavilions such as Sigyeongjeong, Myeonangjeong, Songgangjeong, Doksujeong, Soswaewon, and Hwanbyeokdang. 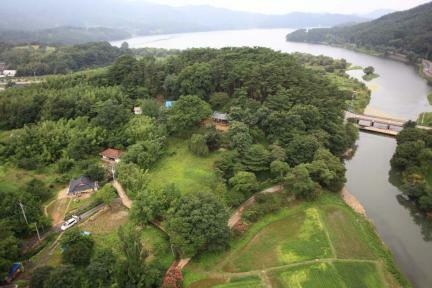 The village and pavilions show that the area around Hwanbyeokdang had been a center of the tradition of private wooded gardens established during the Joseon Period. 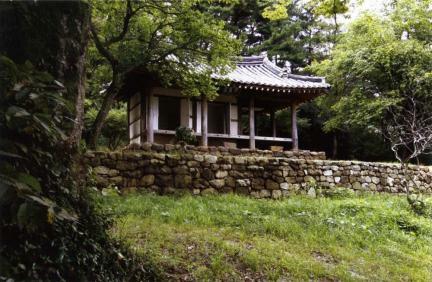 Hwanbyeokdang Pavilion is connected with a group of renowned literati elites of the Joseon Period, such as Song Sun, Im Eok-ryeong, Yang San-bo, Kim In-hu, Kim Seong-won, Kim Dae-seung, and Go Gyeong-myeong who regularly visited it to pay homage to the natural scenic beauty surrounding it through their poetic works. The beauty of the pavilion in the early stage was depicted by So Se-yang (1486-1562) in his poem “Hwanbyeokdang”; the plants growing in the garden around the pavilion in the early 18th century were mentioned by Kim Chang-heup (pen-name: Samyeon, 1653-1722) in his book Namyu ilgi (Diary of a Journey to the South). A scene of its natural surroundings is also captured by the drawing Seongsan gyeryu tagyeoldo (Coping with Summer Heat at the Valley of Seongsan Mountain) contained in Seohadang yugo (Posthumous Manuscripts of Seohadang), a collection of writings by Kim Seong-won (1525-1597), a Neo-Confucian scholar-statesman of the mid-Joseon Period. The cultural and historical significance of Hwanbyeokdang Pavilion has been increased further by an abundance of poetic works written by well-known men of letters: Im Eok-ryeong, Gi Dae-seung, Song Sun, Kim In-hu, So Se-yang, Jeong Cheol, Baek Gwang-hun, Go Gyeong-myeong, Gwon Pil-do, Jeong Hong-myeong, Mok Jang-heum, Yi Eun-sang, Yi Ha-gon, Yi Myeong-han, Kim Chang-heup, Jo Sang-geon, Yang Gyeong-ji, Jeong Min-ha, and Seo Bong-ryeong.